Let’s start with a description of the area we have visited: the ‘Flinders Ranges’ is far more than the area from Quorn till Wilpena. Actually, Quorn and Hawker are situated in the Southern Ranges, the area between Lake Frome and Leigh Creek is part of the Northern Flinders Ranges. 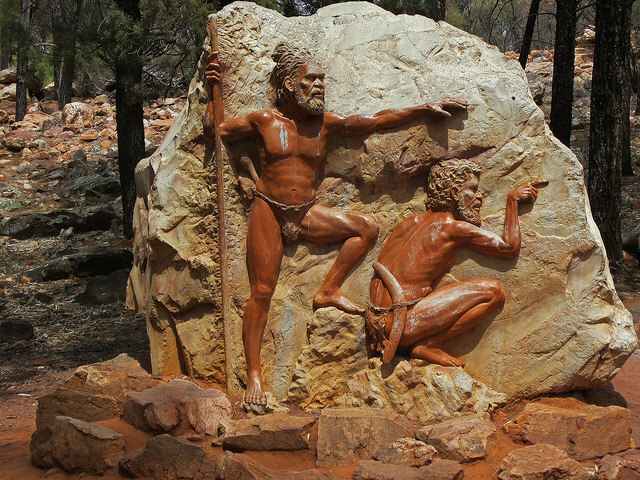 We’ve been twice to the Flinders Ranges, both times we stayed in Hawker, which is an ideal base to explore the region. 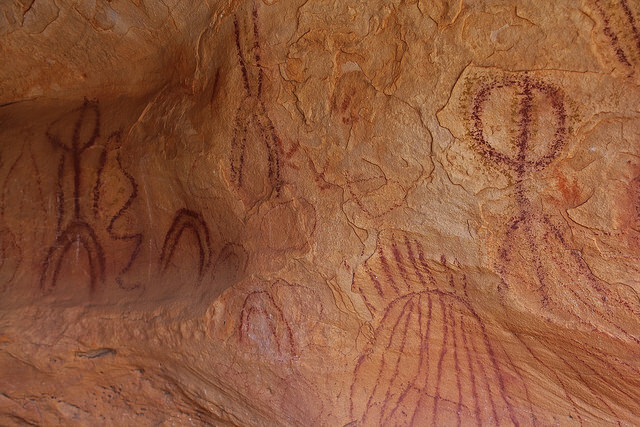 Coming from the south there are some caves with beautiful aboriginal art work to visit. Hawker itself is a small town, but it has a nice lookout – Jarvis Hill Lookout (the hill is steep, but not as steep as the warning sign tells you). From the lookout you have to climb along a rocky path, but the vista is awesome! Driving away from town there is another lookout: Castle Rock Lookout, a nice place to enjoy the sunset and the moonrise (and popular with painters). Yurlu, the Kingfisher, travelled south for a ceremony. At the same time, there were two serpents (Akurras) also travelling south. Yurlu had made a fire to announce he was coming, but left a trace of smoke. The serpents followed him. The Akurras stayed at the Pound where the ceremony was held, surrounded the people inside and ate them except for two initiates and Yurlu, who could fleed. Today the serpents form the sides of the Pound. From the Flinders Ranges you can either drive back south, or go up north towards the Oodnadatta or Strzelecki Track.